Judy Faye Weaver Sullivan, 64, a native and resident of Sanktown, Alabama passed away Tuesday, April 10, 2018 at her home. 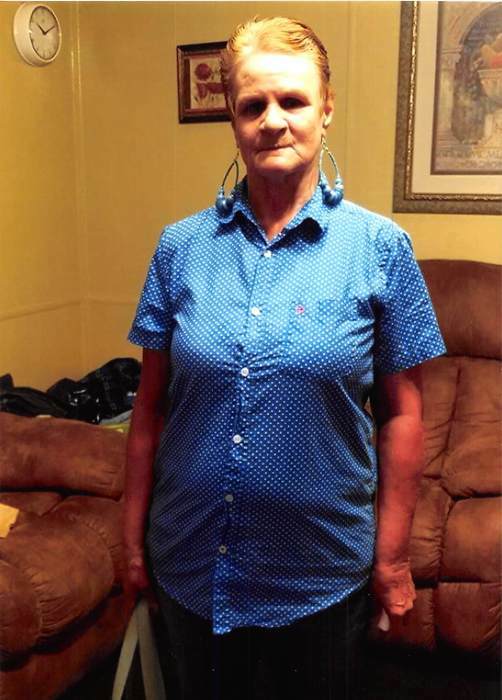 She was a homemaker and member of Oak Hill Community Baptist Church. She was an avid Alabama football fan and enjoyed spending time with her family. She was preceded in death by her parents, Kelly Tanner Weaver and Denzil Byrd; son, Johnny Sullivan; siblings, Jug Head Weaver, Ray Byrd, Travis Byrd, Nellie Byrd, Hayward “Possum” Weaver, Norman T. “DeeDee” Weaver, and Eunice Tad Weaver; and grandson, Nathan Reed. Those left to cherish her memory are her children, William, aka Chipmonk, Weaver (Mary), Evie Reed (Dennis), Judy Maxine Sullivan and Rose Mary Sullivan; grandchildren, William, Dennis, Tiffany, Sally, Jennifer, Lil Evie, Jimmy, Mackenzie, David, Sherry, Miranda, and Marianah; great grandchildren, Daylon, Taylann, Evan, Hayden, Christian, Emma, Mckenly, Daythan, Ray Ray, Zaylee, Braylon, and DeeDee; special friends, other relatives and friends. The wake will be from 6-9pm Thursday, April 12, 2018 at Sims Chapel Holiness Church. The funeral service will be 2pm Friday, April 13, 2018 at Sims Chapel Holiness Church with Rev. Willie Long, Jr. and Rev. Phil Herr officiating. Burial will be follow in Saint Thomas Cemetery in Fairford, Alabama. Online condolences may be given at www.freemancitronelle.com. Freeman Funeral Home – Citronelle, Alabama.